We have some exciting news to share: we have the honor of receiving a 2017 Brandon Hall Group Excellence in Technology Award! Our product, Adoptify, won Gold in Best Advance in Unique Learning Technology. What is Adoptify you ask? It’s a customizable web platform designed to leverage behavioral science and social game mechanics to create a fun, measurable, and integrated approach to learning, change, and organizational readiness. 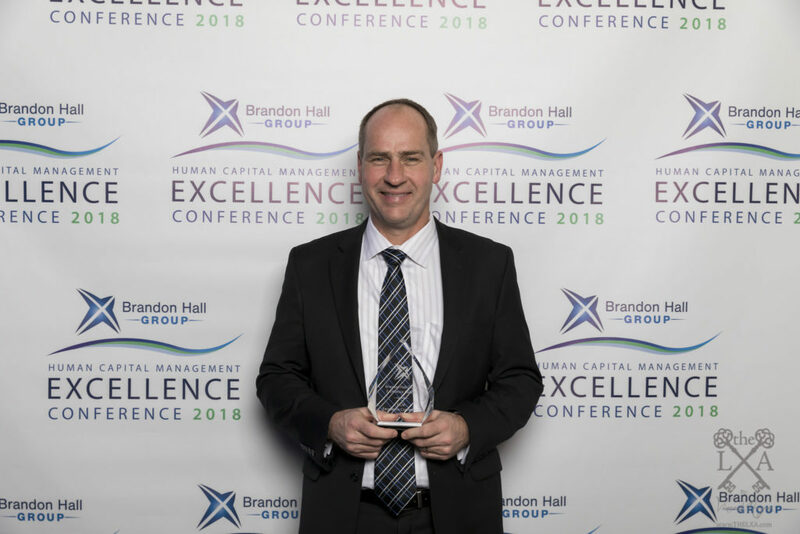 TiER1’s CEO Greg Harmeyer accepts the Brandon Hall Group Excellence in Technology Award. Photography by The LXA Inc.
With Adoptify, we’ve helped companies change their overall operating model with a series of system and business process implementations. Thanks to team-based competitive challenges, employees are fully engaged as they learn new knowledge and skills and align to organizational readiness. Adoptify has also helped companies implement a suite of new technology systems to bring the organization up to speed across varying business units. By allowing leadership to capture real-time data, they can predict where adoption may be lacking and address it quickly. Plus, it doesn’t hurt that Adoptify makes change fun for employees with rewards and incentives that recognize early adopters, teamwork, and collaboration. Why did we develop Adoptify? When people are asked to learn—whether that’s learning (or relearning) a new skill, behavior, attitude, or way of doing things—they are being asked to make a change. And change is hard. For organizations trying to shift the way people think, behave, and accomplish their work, change is a daunting task. Organizations must inspire their people to follow a new way of doing things while also mitigating their personal stress. This effort requires significant, intentional design. Success hinges on effective communications and training, but no matter how awesome those materials are, it’s still a struggle to get employees to engage with them. In other words, making change something that’s fun and inviting drives participation, which increases everyone’s readiness. And all of that directly impacts the success of an organization’s project—and their business. So, how do organizations get people to want to do what they have to do? To help organizations capitalize on this snowball effect, TiER1 created Adoptify to be a gamified adoption platform that makes it easy for people to engage in the change and develop the readiness they need. Our team is incredibly grateful to share this news with you and for the clients who partner with us to advance corporate learning and technology. Learn more about the Brandon Hall Award program or about Adoptify.